Master gardeners tell us that gardens should contain elements of surprise. As you wander through a garden, you should not be able to anticipate what is around the next bend. Until you get there and see for yourself. I'd like to add to that advice, "and make it whimsical." This trio of mushrooms will fulfill both those expectations. Tucked among low-growing foliage, they are a delightful surprise. Each is made with a stem-shaped vase and an inverted bowl. I have to be careful to look for bowls that don't have a rim, as that would be a dead give away that it was a bowl! And It's hard to find glass bowls that are still in good shape in second-hand shops! The mushroom trios are my most popular item and are often purchased for gifts. 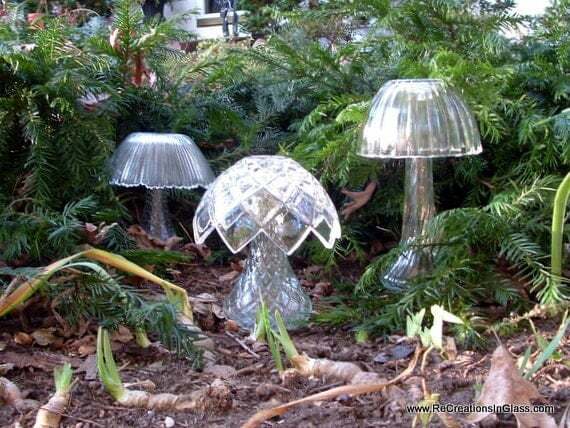 Made entirely with re-purposed glass, the mushrooms measure 9 inches, 7 inches, and 6.6 inches. SOLD - Thank you!